The articles listed here are taken from an 89 page, A3 size, scrap book of press cuttings. When Elsie left the stage to get married in 1911 she was presented with a handmade scrap book illustrated by Doris Cooper. (Sister of Gladys Cooper?) The scrap book of which I have a facsimile was sold along with the Doris Cooper volume. I am not sure if this was Elsie's personal scrapbook or another that she was presented with. Title Page, "PRESS CUTTINGS CONCERNING MISS LILY ELSIE." 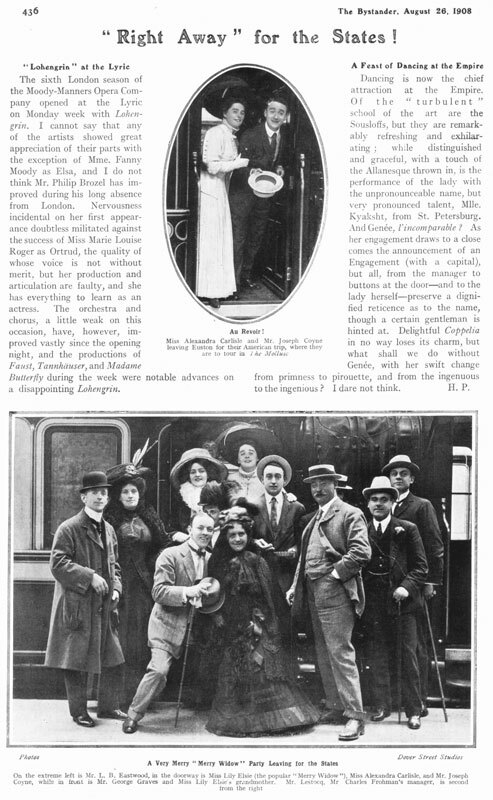 The Sphere, August 24th 1907, Page 187, Picture from The Merry Widow. The Tatler, July 10th 1907, Page 28, Pictures from The Merry Widow. The Sphere, July 13th 1907, Page 45, Pictures from the Merry Widow. The Tatler, November 10th 1909, Front Cover, Picture from The Dollar Princess. The Illustrated Sporting and Dramatic News, November 13th 1909, Page 428, Pictures from The Dollar Princess. The Tatler, February 15th 1911, Front Cover, Picture from A Waltz Dream. The Tatler, June 21st 1911, Page 319, Pictures from The Count of Luxembourg. The Illustrated Sporting and Dramatic News, June 24th 1911, Front Cover, Pictures from The Count of Luxembourg. Untitled, Pictures from The Count of Luxembourg. The Illustrated Sporting and Dramatic News, November 6th 1915, Page 280, Review of Mavourneen. The Illustrated Sporting and Dramatic News, November 6th 1915, Page 278, Pictures from Mavourneen. The Sphere, December 25th 1915, Page 345, Pictures from Mavourneen. The Illustrated Sporting and Dramatic News, February 9th 1918, Front Cover, Pictures from "Pamela". The Sketch. July 14th, 1926, "La Demoiselle Élue". Eve, March 23rd, 1927, photo and caption commenting on 'The Blue Train'. 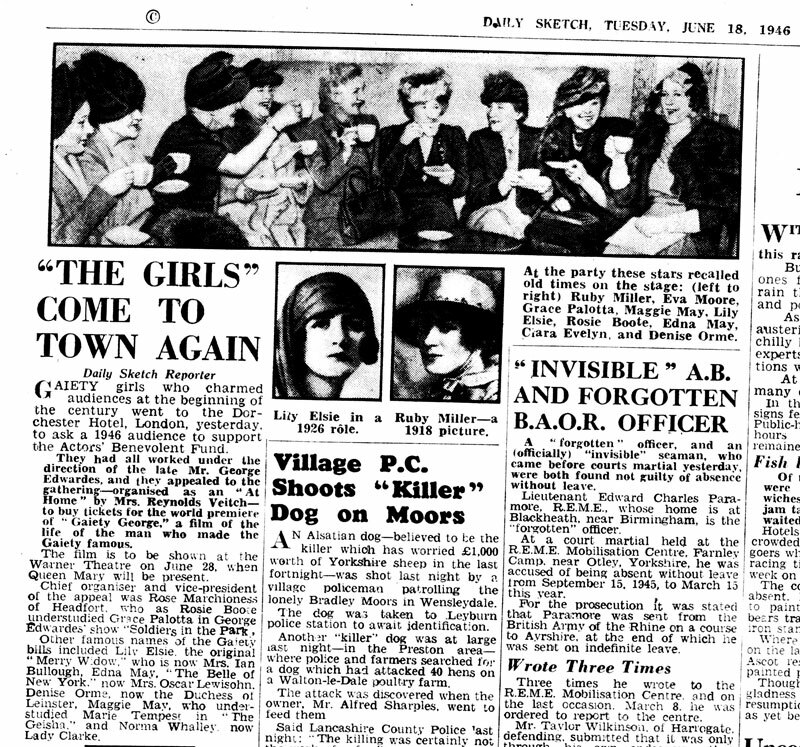 Also, Daily Express, May 11th, 1927, 'The Blue Train' first night review. The Sunday Express, May 15th,1927, review by Hannen Swaffer. The Sphere, may 14th, 1927, two photos, one from Blue Train rehearsal. Tatler, May 25th, 1927, and Play Pictorial, August, 1927, two photos from Blue Train. Eve, May 25th 1927, page 451. Item on 'The Blue Train'. ".... writers have exhausted their stock of superlatives in playing tribute to the unchanging charm of Lily Elsie." Play Pictorial, No 305, front cover, The Blue Train. Untitled photo from the Blue Train. Play Pictorial page with photo from the Blue train. Home Chat, August 13th , 1927, costumes from Te Blue Train. The Sketch, August 17th, 1927, two photos of Elsie in her garden. Another at home photo from the Sketch, as above. Daily Express, Monday Auguist 29th, 1927, last night of the Blue Train. Also Daily Express, Wednesday, August 31st, 1927, more on the sudden closure of The Blue train. Daily Express, Wednesday August 31st, 1927, article by Elsie about her return to the stage. Also, Daily Sketch, Friday September 9th 1927, report that Elsie attended first night of 'The High Road'. And, Daily Sketch, Tuesday December 13th 1917, report of Elsie attending charity event. Weekly Dispatch, January 15th 1928. Elsie attending Daly's reunion for retirement of Garrett Todd. 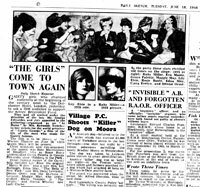 Daily Sketch, Monday January 16th 1928, another review of the reunion. The Tatler, December 21st 1927, charity event, as above. The Tatler, January 25th 1928, Garrett-Todd retirement. Daily Sketch, Wednesday January 18th 1928. Report of Elsie and Ion leaving for South America. The Sketch, January 25th 1928, photo of Elsie and Ion on the boat. Evening News, Friday January 27th, 1928, report on Elsie's wardrobe for the Argentine trip. Untitled cartoon. Daily Mirror, April 30th 1928, Elsie attends theatrical party at the Savoy. The Sketch, may 16th 1928. Elsie and Ion at Chester horse race meeting. Vogue, June 13th 1928. Sketch and text by Cecil Beaton. Daily Sketch, Friday June 29th 1928. Elsie attends farewell lunch for Edgar Wallace. Eve, June 27th 1928. Photo of Elsie and Zena dare at Ascot race meeting. Vogue, August 8th 1928. Text by Cecil Beaton. Sunday Dispatch, July 29th 1928. Article on changes in fashion. Eve, September 12th 1928. Photo and description of Elsie's car, a Hooper 2-seater cabriolet body fitted to a Daimler 20hp chassis. Vogue, September 19th 1928. Sketch by Beaton. The Daily Chronicle, Wednesday September 26th 1928. Fashion article mentioning Elsie's costumes for 'Taken by Storm'. Sunday Pictorial, September 30th 1928. Photo from 'Taken by Storm'. Daily Mail. Wednesday October 3rd 1928. Suggestion of Merry Widow revival. Daily Express, Thursday October 4th 1928. Costumes for 'The Truth Game'. Daily Sketch. Saturday October 6th 1928. Report of the Truth Game first night, also item on Norman Hartnell's costumes for the show. The Daily Chronicle, Saturday October 6th 1928. Another review. Daily Mail and Daily Mirror, both Saturday October 6th reviews of The Truth Game. Sunday Graphic and Sunday Pictorial, both October 7th 1928. Reports as above. Daily Sketch Monday October 9th 1928. Reports on The Truth Game. Eve. October 10th 1928. Pictures from The Truth Game. Eve. October 10th 1928. Portrait of Elsie. The Evening News, Wednesday October 10th 1928. Item on Elsie's youthful looks. The Tatler. October 17th 1928. Item on the eight costumes Elsie wears for The Truth game. Daily Sketch. Thursday October 18th 1928. Pictures from The Truth Game. Daily Mirror. Friday October 19th 1928. Another photo from the same show. Program cover for the Truth game. Sunday Graphic. October 21st 1928. Elsie and Ivor in The Truth Game. Eve. October 24th 1928. Another photo of Elsie and Ivor Novello. The Tatler. October 31st 1928. Elsie at a society event. The Sketch. October 24th 1928. Photo from The Truth Game. Sporting and Dramatic. October 27th 1928. Fashion photo of Elsie from The Truth Game. Sunday Pictorial. October 28th 1928. Gala supper at the Ambassadors Club with Novello. Daily Sketch. Monday October 29th 1928. Another mention of Elsie at the Ambassadors'. The Illustrated Sporting and Dramatic News. October 27th 1928. Photo feature on The Truth Game. The Tatler. November 7th 1928. Caricature by Nerman and review of The Truth Game. The Tatler. November 7th 1928. As previous page. the Daily Chronicle. Thursday November 1st 1928. Photo of Elsie and Ivor. The Sphere. November 10th 1928. Picture from The Truth game. Tatler. November 14th 1928. Elsie to present the prizes at Charity Ball. The Tatler. November 14th 1928. Picture from The Truth Game. Two more photos, as above. Vogue. November 14th 1928. Items on The Truth Game. Vogue. November 28th 1928. Article on fashion, on and off-stage. Evening News. Thursday December 6th 1928. Comments on Elsie's gown at an evening function. Daily Sketch. Saturday December 8th 1928. Pictures from the Truth Game. Daily Mail. Saturday December 8th 1928. Mention of Elsie in The Truth Game. Daily Chronicle. Saturday December 8th 1928. Picture of Elsie and Ion. Sunday Dispatch. December 16th 1928. Passing mention of Elsie at a party. Daily Mirror. Wednesday January 2nd 1929. Mention of 100th performance of The Truth Game. Daily Sketch. Wednesday January 2nd 1929. Elsie and Ivor at Chelsea Arts Ball. Daily Sketch. Thursday January 10th 1929. Elsie at Novello's birthday party. Daily Express. February 13th 1929. Elsie guest at gallery diner at Criterion Restaurant. Daily Express. February 20th 1929. Photo of Elsie without explanation. The Play Pictorial. Scene from The Truth Game. The Play Pictorial. Front cover for The Truth Game. Daily Express. Wednesday March 27th 1929. Review of the current production of The Merry Widow. Sunday Dispatch. May 19th 1929. Comment on Elsie's hair. The Daily Mail. Friday June 14th 1929. Elsie appears in the Truth game on tour at the Empire Theatre, Southampton, on the south coast of England. The Graphic. April 20th 1929. Article by Viola Tree about The Truth Game on tour. Second instalment of above article. April 27th. Part four. Newcastle. May 11th. Part six. Liverpool. May 25th. Part seven. Manchester. June 1st. Part eight. Lancashire. June 8th. Part nine. Leeds. June 15th. Part ten. Southsea. June 22nd. Final part. New forest, Hampshire. July 6th. Sunday Dispatch. June 16th 1929. Elsie back at Daly's with The Truth Game. Daily Mirror. Mention of Truth Game tour. Daily Sketch. June 25th 1929. Another mention of production at Daly's. Daily Express. June 26th 1929. Brief report of opening night at Daly's. Program cover. The Sketch. July 3rd 1929. Portrait of Elsie. Sunday Dispatch. October 27th 1929. Curios mention of Elsie's ankles? Daily Sketch. November 20th 1929. Elsie attends party at the Ritz. Now this is an interesting page - The Bystander [1903-1940 merged with Tatler], page 436, 26th August 1908. A photo, likely at Euston Station, captioned, 'A very Merry "Merry Widow" Party leaving for the States'. On the extreme left is Mr. L B. Eastwood, in the doorway is Miss Lily Elsie (the popular "Merry Widow"), Miss Alexandra Carlisle [Actor 1886-1936], and Mr. Joseph Coyne, while in front is Mr. George Graves [Actor in MW] and Miss Lily Elsie's grandmother. Mr. Lestocq, Mr Charles Frohman's [American theatrical producer] manager is second from the right. Grandmother Emma would have been 74 in 1908 - could be her! I think that is Elie's mother second from left. Here is a Daily Mail newspaper clipping marking Elsie's 70th birthday. (8th April 1956) This has been contributed by the nephew of Miss Gladys Jones who was Elsie's day time companion at the time when she lived at Palehouse Common, Sussex in a cottage shared with Mrs. Edvina King. Daily Sketch. June 18 1946. Tea at The Dorchester. 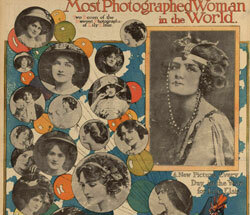 Ruby Miller, Eva Moore, Grace Palotta, Maggie May, Lily Elsie, Rosie Boote, Edna May, Clara Evelyn, Denise Orme. Follow this link to see more.